Plagiarism: passing off another’s work as your own. It’s a tricky issue, and one high­lighted with aplomb in an art­icle recently pos­ted by Alma Alexander on the Science Fiction and Fantasy Novelists blog. To para­phrase Ms Alexander, pla­gi­ar­ism is an emo­tion­ally-charged word whose dark­er con­nota­tions should not be, er, con­noted in the case of those car­ry­ing out spe­cif­ic forms of research. Novelists, for example. Academia puts it thusly, that lift­ing inform­a­tion from just one source is pla­gi­ar­ising; lift­ing from many sources is research. I teach pla­gi­ar­ism as this: When you include some­thing — could be a cri­ti­cism, a descrip­tion, any­thing — in an essay or a report and you do not provide a cor­rectly ref­er­enced source for that some­thing, then you are pla­gi­ar­ising. By omis­sion, you imply that you are the cre­at­or of that some­thing. You also obscure the work that you’ve done in the con­struc­tion of the essay (range, depth and your under­stand­ing of cer­tain papers). Now, pla­gi­ar­ism is a slid­ing scale. “Freud was rather pants” might be a use­ful sum­mary of much work into the worth of early psy­cho­ana­lys­is (a some­what stub­born stain on the rep of psy­cho­logy, that) and I’m not going to a mark a stu­dent too harshly if this state­ment isn’t ref­er­enced; the stu­dent is quite cap­able of com­ing to this con­clu­sion them­selves, even if the con­clu­sion pep­pers the lit­er­at­ure. But if the stu­dent writes, “It might be argued that Freud con­sidered dreams to be the roy­al road to the sub­con­scious,” and does not include a ref­er­ence, my nos­trils will twitch. If the whole essay stinks — i.e. it includes an HTML hori­zont­al line that the stu­dent hasn’t been able to delete since copy­ing the text whole­sale from Wikipedia — then I’ll press the pla­gi­ar­ism alarm beneath my desk, which is linked to the Vice Chancellor’s heavy mob. Ostensibly, the issue of pla­gi­ar­ism in regard to lit­er­at­ure is dif­fer­ent, but I’m not so sure. Basically, the con­sensus seems to be: You can take things from oth­er people’s work because (a) they’re prob­ably dead (most people are, at this point in our evol­u­tion­ary his­tory); (b) it’s too both­er­some to attrib­ute ori­gin­al­ity, so why go to all that effort? Well, that may be true on occa­sion. 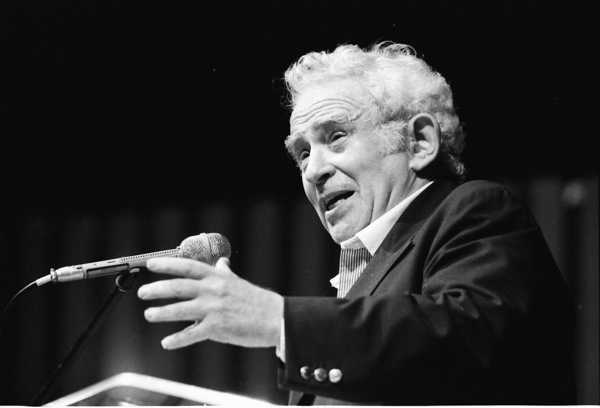 I’ve no doubt that Norman Mailer’s last book (The Castle in the Forest) con­tains a great deal of research into the early life of Adolf Hitler and I’m cer­tain that, at its close, I’ll have no idea what sources he used. As a read­er, do I need to? Probably not. And yet, there are ele­ments of the book that I’ve — either cor­rectly or incor­rectly — iden­ti­fied as ori­gin­al to Mailer. The idea, per­haps, of God as the Dumkopf, or that Fallen Angels fiddled with Hitler’s child­hood. If I were to look at Mailer’s sources and see a book that intro­duced this idea, I would feel some­what let down. I’m one of those writers who lists his sources and help­ers at the end of the book. Not to take the mor­al high-ground in a pla­gi­ar­ism sense, but I still have the aca­dem­ic urge to cite my ref­er­ences. Not, either, in a PhD-like way (my thes­is ref­er­ences ran to over fifty pages, I think) but just to indic­ate to the read­er the proven­ance of the book, in research terms at least. Its themes and char­ac­ter are mine. I also want the people who helped me to know that their aid was appre­ci­ated. Two Boeing 747 pilots have read over the bit of my second nov­el where I describe an air crash from the point of view of a pilot (opined one: ‘I don’t think you’ve under­stood the basic prin­ciples of flight’); it would have been lit­er­ally impossible to do it without them, and it would be odd not to cite them as a source. Anyway, the dishes won’t wash them­selves. Take a look at Alexander’s art­icle. It raises some inter­est­ing issues.